← Yikes! When Did Ugly Christmas Sweater Parties Start? Can’t believe it’s December — and the holidays are coming right up. November flew by! Here’s a recap. 1) Did my first webcam phone call ever — very cool! I could see my son, his wife, and their dog while we talked over the computer for free. When I was a kid, everyone thought it would be a “Jetsons” experience to actually see who was on the other end of the line — although experts predicted it would happen one day. And we just did it. Wow. 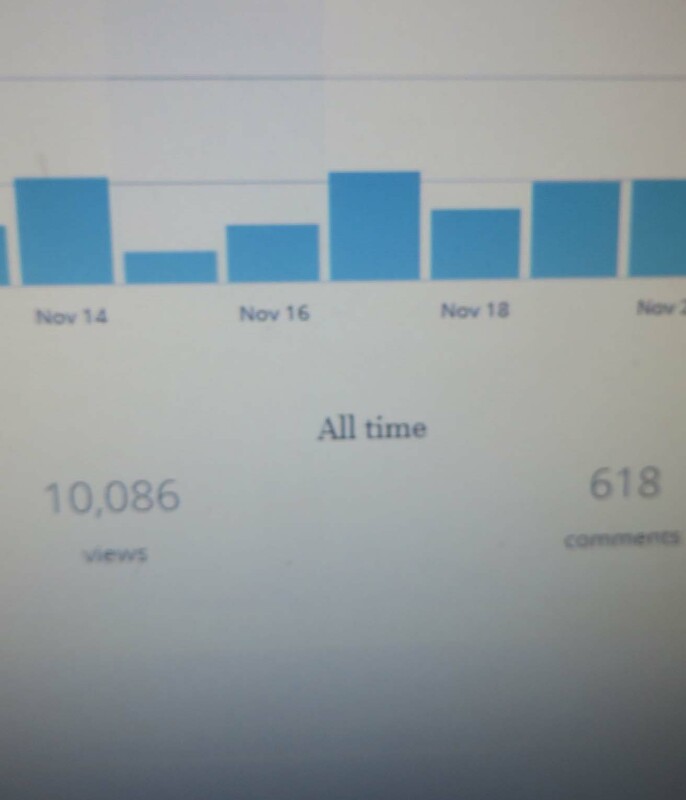 2) The Thoughts, Tips and Tales blog exceeded 10,000 hits after 6 months and 6 days. Yay! 3) The blog also had a few record-breaking days of hits in November, too. People seemed to look up adult advent calendar gift ideas quite a bit. 4) Went to a Myrtle Beach weekend scrapbook retreat (and had an oceanfront room — aaahhh). Met J, who’d formerly lived near me. We’d seen each other at kid-related events over the years, but had never formally met. She just retired, and she started doing stand-up comedy because it was on her bucket list. The way she described her “gigs” at a family restaurant (where every diner had to cross in front of her during her act and the staff yelled out the order numbers whenever she took a breath) and at the local bowling alley was hysterical. Loved her feisty attitude! 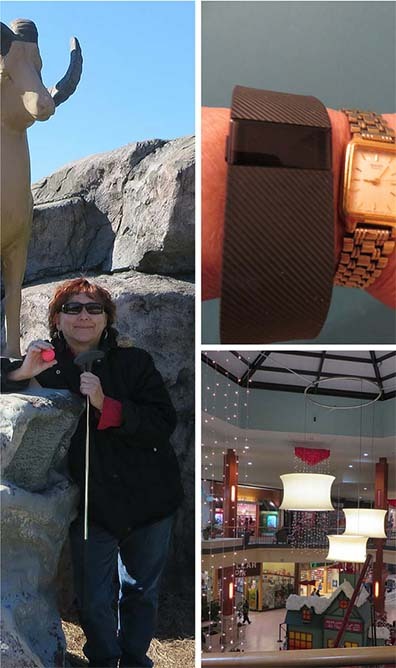 5) Got a new Fitbit Charge to replace the Fitbit Force I returned. After losing it (up my sleeve, it turned out after a frantic 20-minute search…) the second day, it’s been great. A blog post review of it describes the new product. 7) Took Sylvia on a road trip to my son and daughter-in-law’s house about 350 miles away for Thanksgiving. We had the best meal ever at a hotel ballroom- it was like a superb home-cooked meal. Then my son and I went to a place called Funopolis and played 36 holes of mini-golf (see photo above; I wasn’t really out west standing next to a wild animal) and some air hockey before I left for home. 8) Started Christmas shopping in earnest and did something I said I’d never do: went to a mall (while out of town) on Thanksgiving evening, although I’m against it in principle. It was actually very nice, and while there were quite a few people there, it wasn’t frantic and the cashiers weren’t mobbed like on Black Friday. It was like friends and families just came out to the mall to hang out after Thanksgiving dinner. 10) Had five days in a row off work over Veteran’s Day holiday and also five days in a row off for Thanksgiving. Ahhh. Found it very hard to concentrate at work today! 10) Have had horrible neck and shoulder pain (not so good) for three weeks; got temporary relief with a great massage, but it still hurt like crazy after that. Finally figured out what caused it — my stand-up desk at work and incorrect monitor placement! Had it reluctantly removed and that seemed to have fixed everything (good)! Hope you had a good Thanksgiving holiday and your December is great, too! 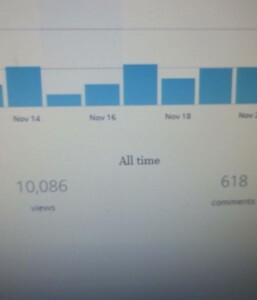 This entry was posted in Black Friday, bucket list, fitbit, polga, road trip, scrapbooking, stand-up computer desks, Thanksgiving, thoughts tips and tales and tagged 10000 blog hits, Black Friday, bucket list, road trip, scrapbooking, stand up computer desk, Thanksgiving, thoughtstipsandtales polga. Bookmark the permalink. wow a stand up desk? Good for you! I could never use one of those. I do make sure I get up and walk around or do some activity every 20 mins though. I get neck pain and shoulder pain too. It’s good you adjusted your monitor that will help for sure. Sounds like you had a very eventful month! Always enjoy reading your posts! Number five is sooooo something that I would do! Webcam phone calls do feel like something out of the jetsons! Hey congrats on the blog stats that is great! (always fun) to read a grat list with a lot of activity (for the week)! (It lets me use exclamation points, without looking like I’m shouting. ** since you ask, there is something call ‘the Book of Secret Rules (aka the Secret Book of Rules) that, while allowing all the same benefits and good things found in grat blogs, lends itself to a certain…creativity. But I’ve said too much already!! Congratulations on your blog taking off so fast and so well! And welcome to the TToT blog hop. You month sounds like it was filled with fun and time off from work – which is always a good thing! I hope that December brings you much fun and time off as well! I’m always impressed when a restaurant can carry off a meal you would cook at home. The bar has generally already been set high by your own cooking or a family members cooking.